Join us Sunday July 16th at 2pm to celebrate the joint release of Hard Crackers: Chronicles of Everyday Life #3,and Visiting Day, a new zine about the visitation process in the New York City jail system. In addition to the New York crew, Hard Crackers editor Noel Ignatiev and Visiting Day illustrator Nate McDonough will both be visiting from out of town. We will have copies of both publications on hand, and a few mercifully short readings. A unique publication: political but not absorbed in elections or program, literary but not inflated, scholarly but not scholastic. Includes “Into the Hollows,” a report from someone who campaigned for Barack Obama in Pike County in 2008 -- raw material for those seeking to understand how popular consciousness can change in a short time. 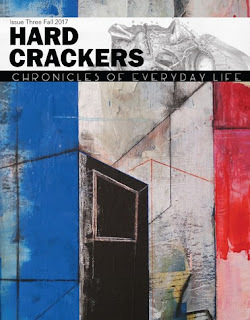 Previous issues can be purchased online, and selections are available to read on the Hard Crackers website. In the summer of 2016 zinesters Maud Pryor (Marmalade Umlaut) and Nate McDonough (Grixly) visited their pal Jarrod Shanahan (Hard Crackers) while he was locked up at Rikers Island. Maud and Nate documented the visit from the visitor’s perspective, and Jarrod from the inmate’s. The result is Visiting Day, the story of their experiences and an illustrated first-person guide for visiting (and being visited by) loved ones at Rikers.The zine can be downloaded in its entirety for free.